20 years ago, Pierce Brosnan at the height of his James Bond fame, succeeded in achieving something very few can testify to: He produced and starred in a reboot of a film that eclipsed the original. No mean feat considering the original version featured Steve McQueen and Faye Dunaway..
John Mctiernan at the height of his directorial powers was a big factor and the on-screen electricity between Brosnan and Rene Russo was, well, electrifying. But, for me, the film’s gem is its original score even though it barely accounts for 15 minutes of the film. Bill Conti took confidence from McTiernan who’s trust in him gave him the confidence to make him go in a music direction that was less than conventional. Conti’s core idea centres around 2 pianos syncopated and playfully interplaying with each other, mirroring the cat-and-mouse courtship between Brosnan and Russo. The structure and jazzy interplay between the 2 pianos are nods to 20th century minimalist composers Terry Riley (Have a listen to In C) and Steve Reich’s (6 Pianos) - But it’s inaccurate to say Conti’s use of the pianos is an example of minimalism: There’s a clear melody cleverly woven in the repeated phrases and helped along by a rich orchestral accompaniment. What I also love is that this music was penned by the same composer who gave us Rocky, the theme tune to Dynasty, and the original song James Bond’s “For Your Eyes Only”. A sign of a top versatile composer who is not afraid of delving into differing musical styles in order to complement similarly differing narratives. 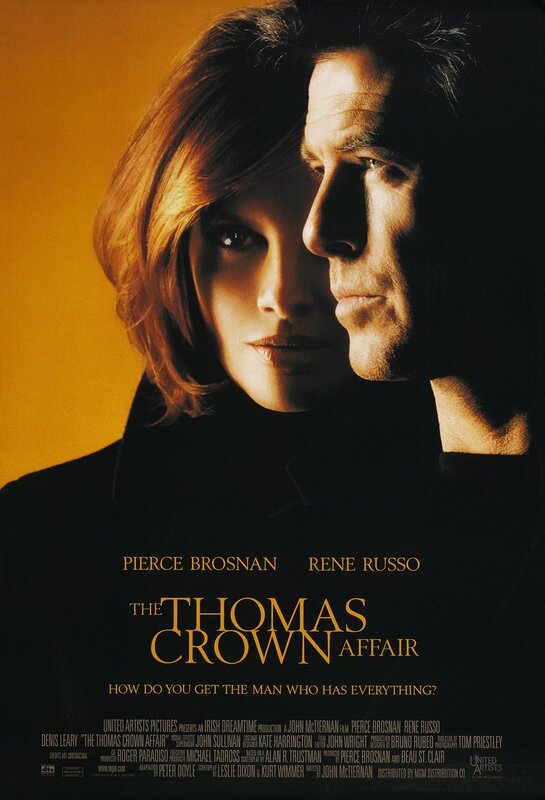 In addition to Bill Conti’s original score, The Thomas Crown Affair soundtrack features a Sting cover of “Windmills of Your Mind”, Nina Simone’s “Sinnerman”, and Wasis Diop’s “Everything”. The lot accounts for 37 minutes. Maybe, the relatively short amount of music explains why there are no musical credits in the film’s poster - But this film’s 15 minutes of score and 37 minutes of total music eclipses not only Michel Legrand’ original score but countless other soundtracks which feature far more music. The 2-piano interplay represents to me blissful, original, and underrated film score.